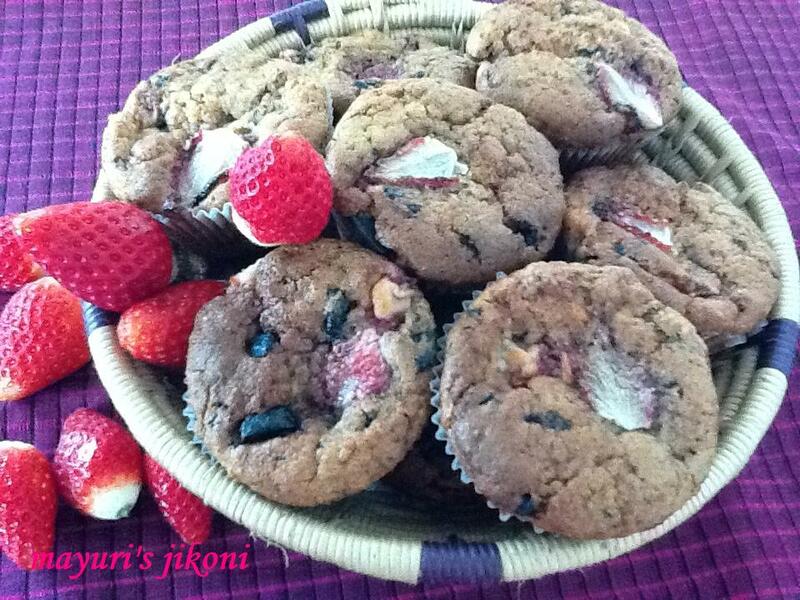 Fresh fruit cupcakes are delicious, soft and fruity. I went to Nairobi last week and came back with loads of fresh sweet strawberries. I had to bake these yummy cup cakes this morning. Ideal for breakfast or tea. I left mine without any decoration but you can serve them with whipped fresh cream or just sieve some icing sugar over the tops. I loved these cupcakes as they are not too sweet and you can actually taste the strawberries and chocolate chips. Preheat the oven at 180°C. Put paper cake cups into a muffin tray or moulds. Sieve the flour, baking powder, soda bicarbonate and salt together. Wash the strawberries, hull them and dice them to make up a cup. Beat sugar and butter together till it is creamy, light and fluffy. Add the milk, yogurt and vanilla extract. Mix it well. Add the flour, chocolate chips and strawberries. Fold the mixture gently using a spatula or a spoon. Do not over mix. Spoon the batter into the cups about ¾ of the way. The number of cups required will depend on the size of cups. Bake for 25 to 30 minutes. Insert a toothpick or knife into the middle of the cup cake. It should come out clean. Remove from the oven. Let the cakes cool for 5 to 10 minutes in the tray. Remove them from the tray and let it cool on a wire rack. Instead of strawberries can use any other fresh berries. Instead of chocolate chips can use raisins or nuts. Serve as a dessert with fresh whipped cream. Add a bit of powdered sugar in the cream before whipping.